The Shroud of Turin. Yes, one very controversial subject. Back in 1988, a radiometric dating study indicated that the shroud was less than a millennia in age, not the 2K years needed if it were to be considered as the burial cloth of Jesus of Nazareth. However, the strange twist is that most of the other evidence like tradition, seeds in the cloth from plants only know to exist in the middle east that are now extinct, coin images from that time period on the cloth and blood marks all seemed to point to the time of around 30 AD. Most astounding is the form of a crucified man seen in the negative on the cloth. But that is not all, the image itself seems to have no know natural causes as it appears. We don’t see other burial clothes with these types of images. Researcher Carpinteri and his team seem to have an explanation for this discrepancy in the evidence – an earthquake. “An earthquake in Old Jerusalem might be behind the famous image of the Shroud of Turin . . . neutron radiation caused by an earthquake could have . . . caused carbon-14 dating done on it in 1988 to be wrong” (1). In other words, when neutron radiation is taking into consideration, a much older age seems to be very likely, probably around the year of Christ’s crucifixion. 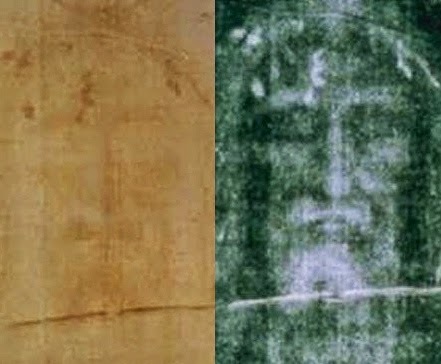 According to the researchers, the novel and peculiar image of the crucified man on the shroud may also be linked to this radiation. I find both points interesting, the scriptures talk about an earthquake at the time of Christ’s death and resurrection. Jesus, when he had cried again with a loud voice, yielded up the ghost. And, behold, the veil of the temple was rent in twain from the top to the bottom; and the earth did quake, and the rocks rent; And the graves were opened; and many bodies of the saints which slept arose, And came out of the graves after his resurrection, and went into the holy city, and appeared unto many. Now when the centurion, and they that were with him, watching Jesus, saw the earthquake, and those things that were done, they feared greatly, saying, Truly this was the Son of God (Matthew 27:50-54). In the end of the sabbath, as it began to dawn toward the first day of the week, came Mary Magdalene and the other Mary to see the sepulchre. And, behold, there was a great earthquake: for the angel of the Lord descended from heaven, and came and rolled back the stone from the door, and sat upon it (Matthew 28:1-2). Did the quakes do more then just shake the ground? Did it effect the radiocarbon dating? Did the quakes release extra neutron radiation, helping form the images of Christ’s preresurrected body as the earth quaked, as recorded in Matthew, during the early hours of the that peculiar Sunday morning? When do you stop being you?